This document goes over Alfresco Cloud. 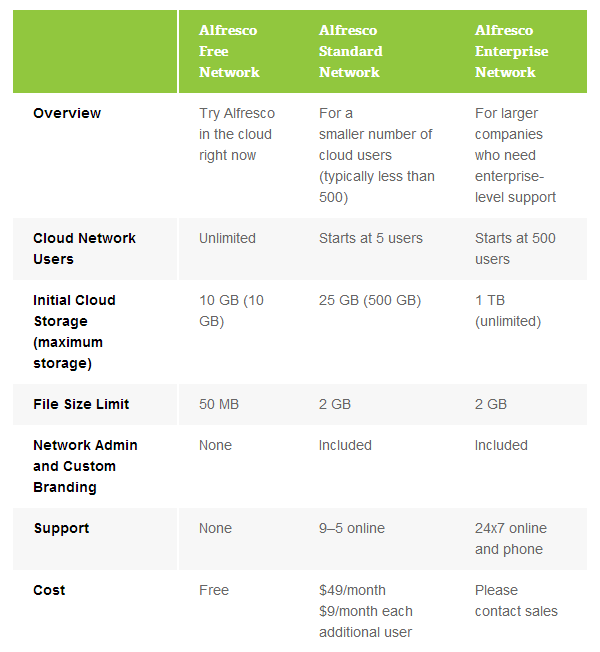 A cloud service from the good people at Alfresco that gives you Alfresco share, maintained and hosted by the Alfresco company..
Alfresco cloud offers a free account with 10GiB of storage to use for life. 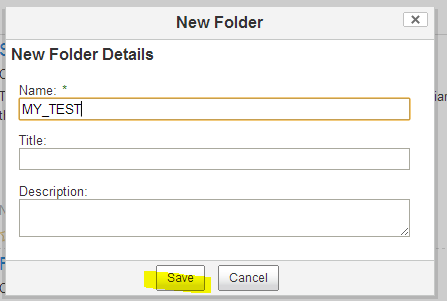 Also files can be no larger than 50 MiB in size (for the free version, the paid one can go up to 2 GiB per file). 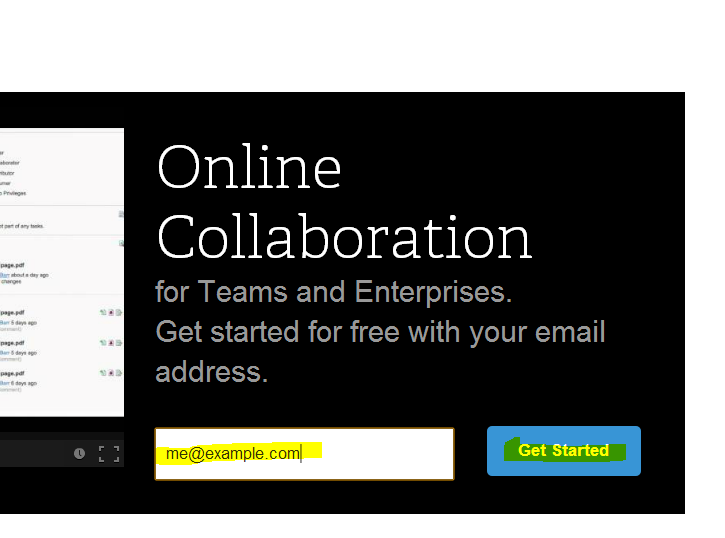 This is a nice place to start testing it out to see if it’s something your business want to pay to use. 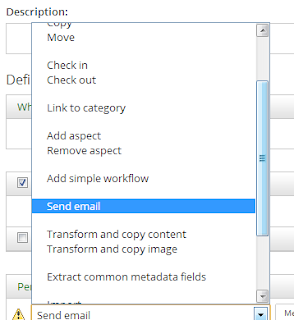 Enter your email address and click Get Started. You must use a company email, you cannot use yahoo.com email or gmail. 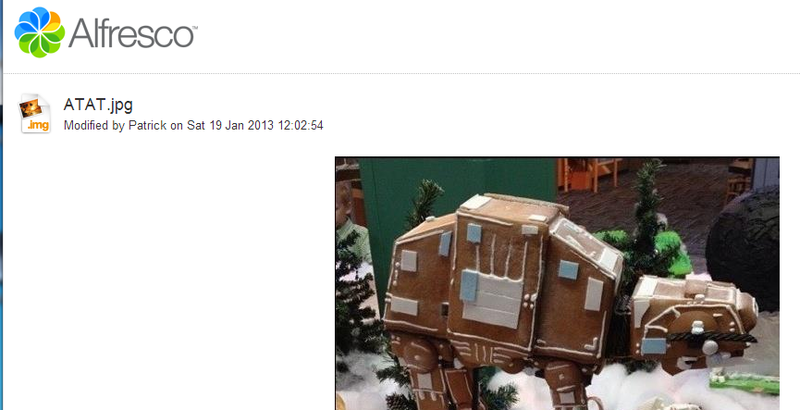 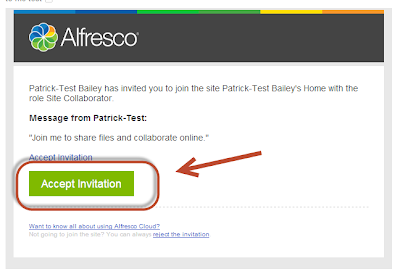 After entering your email, you will get an email from the nice folks at alfresco. 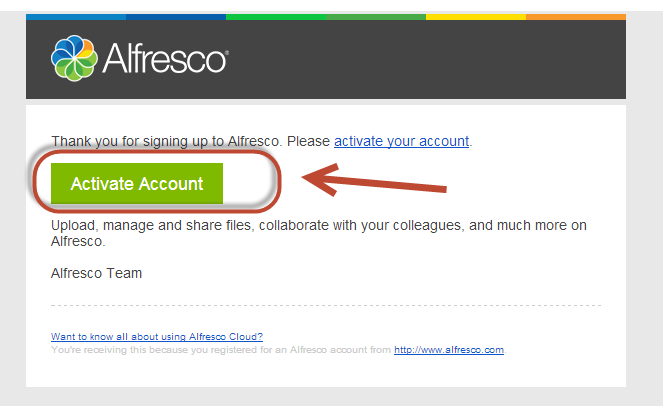 Click on Activate Account, which takes you to the alfresco site. 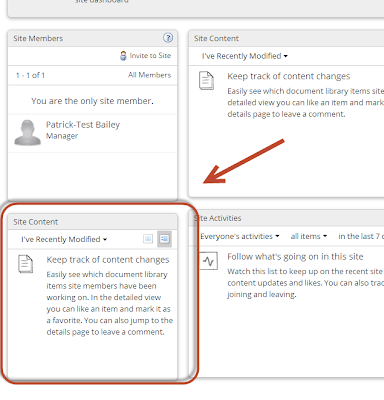 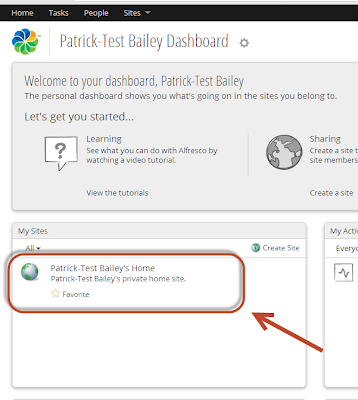 The site is being set up "activating"
You are automatically logged into your Alfresco Share Dashboard. 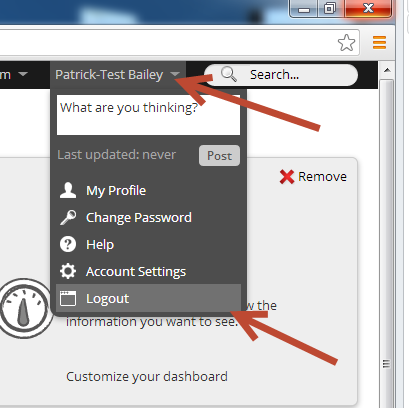 To logout click on your name on the upper right and select logout. 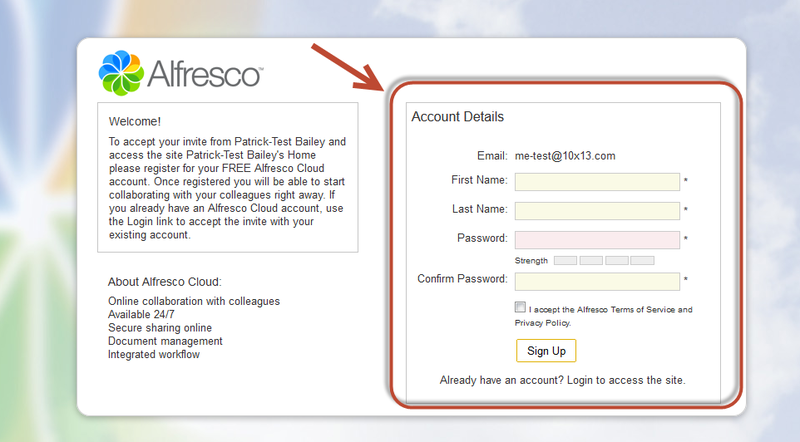 The alfresco cloud creates a default site for you with your name in it. 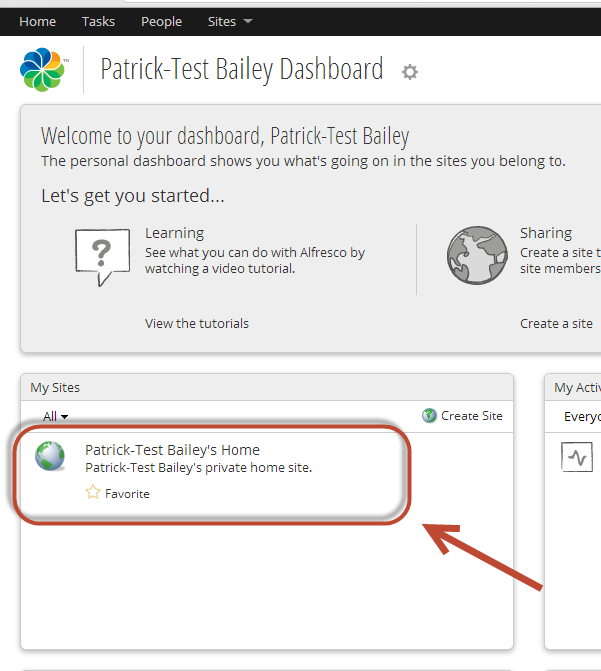 Here is my Patrick-Test Bailey’s Home. 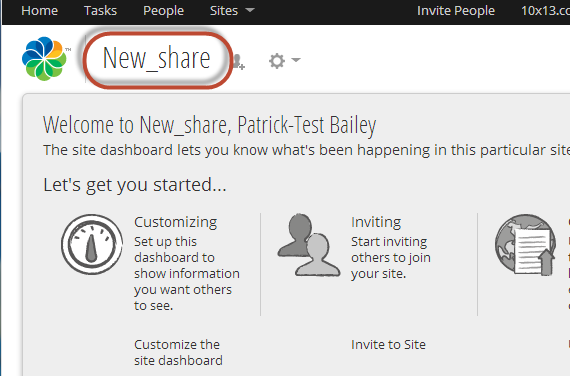 Here is this a share site. Click on the document Library. Drag and drop a few files from your local system to this alfresco folder. 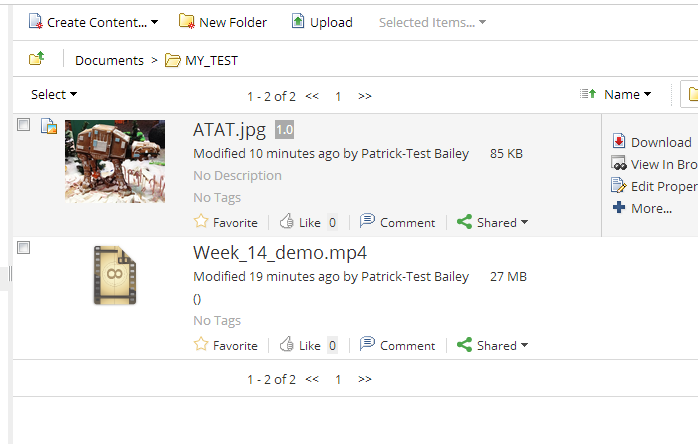 I uploaded a file that was 27 MiB in size, it took over 6 minutes… a bit slow, but for free can you complain? 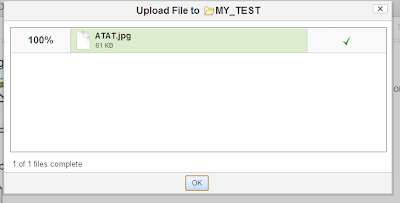 You can see the uploaded file. 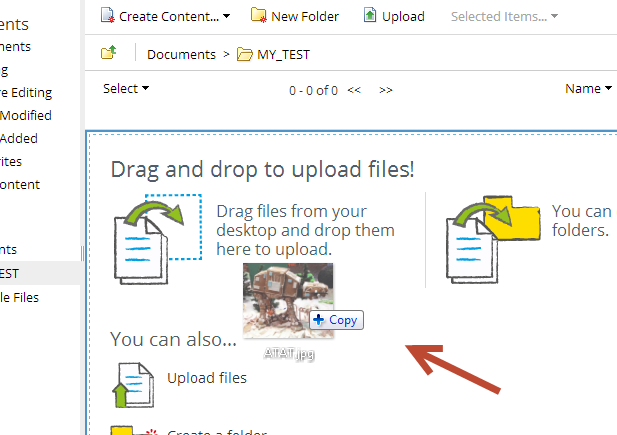 And if you give it a minute and reload the page the icon will be replaced with an image, if Alfresco can make a thumbnail for the file type. Let’s see if we can invite someone to this alfresco cloud share site. 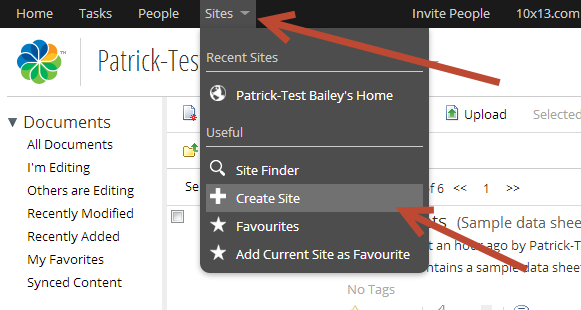 Click on the Invite people icon. 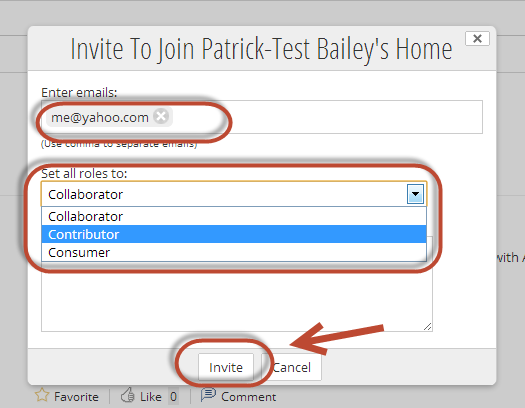 Enter the invitee email, which can be from a yahoo account and select their role. 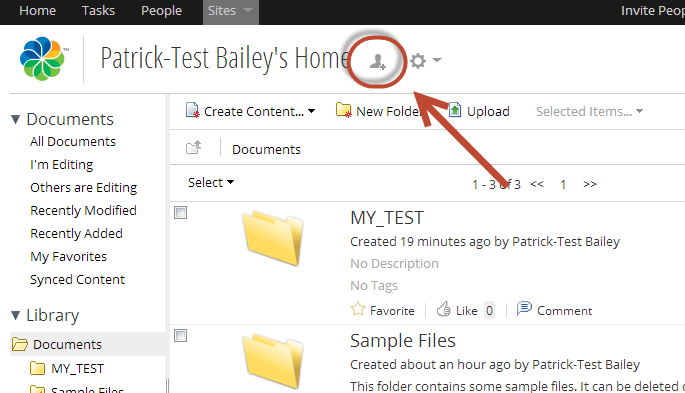 Sharing allows you to create a URL for a file that anyone can use. In other words you can share an image or video with the world without them needing a username/password to the Alfresco share site. 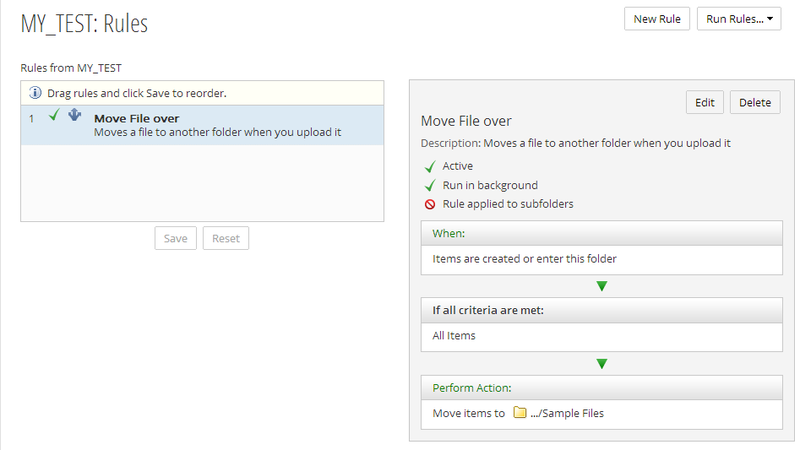 Rules can be applied to a folder to allow it to do things like start tasks or send emails out when a document is added, updated or deleted from a folder. 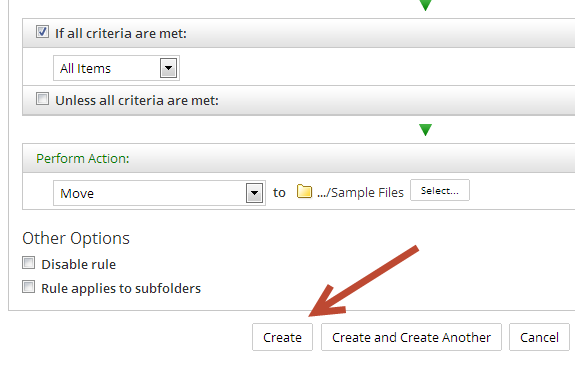 To the far right of a folder click on the + button and select Manage Rules. 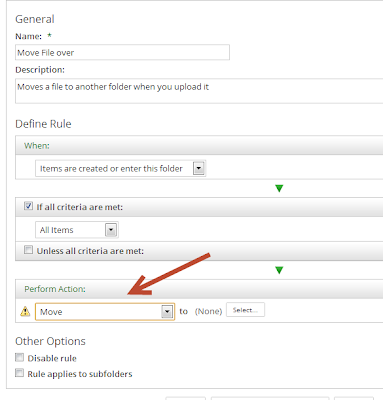 Looking at the actions it looks like you only have a subset of the possible out of the box rules, for example you can’t email. 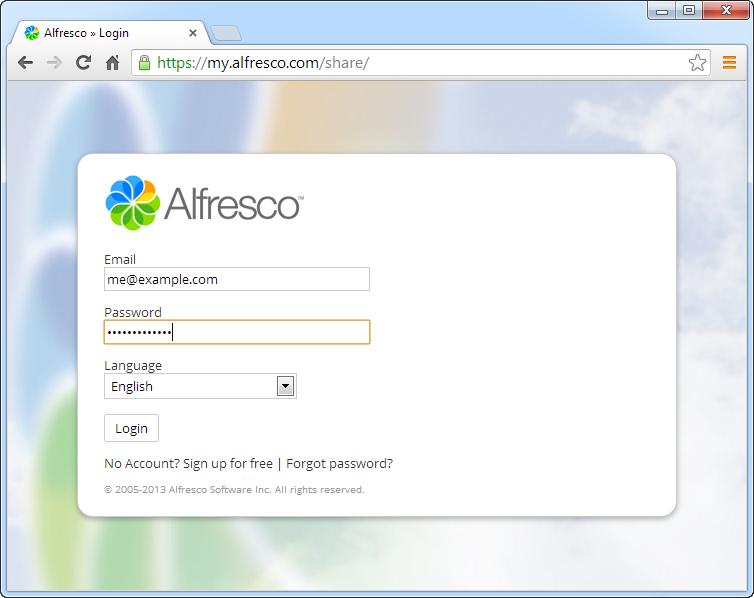 Here is a screen grab from a home installation of Alfresco Share I have. 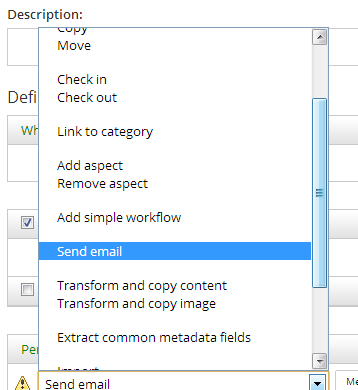 See all the additional options that are available? 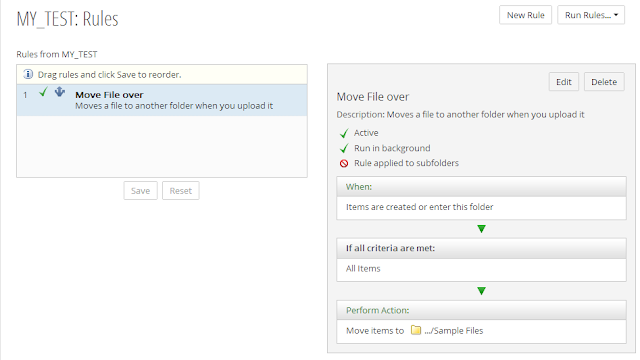 Back to what we have, I am going to create an action that moves a file. 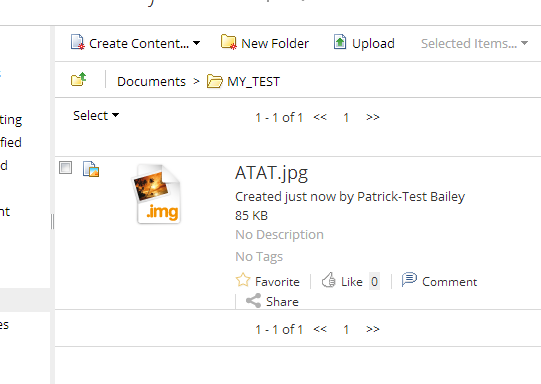 After it uploads you will see that it is not there, the action has moved it. 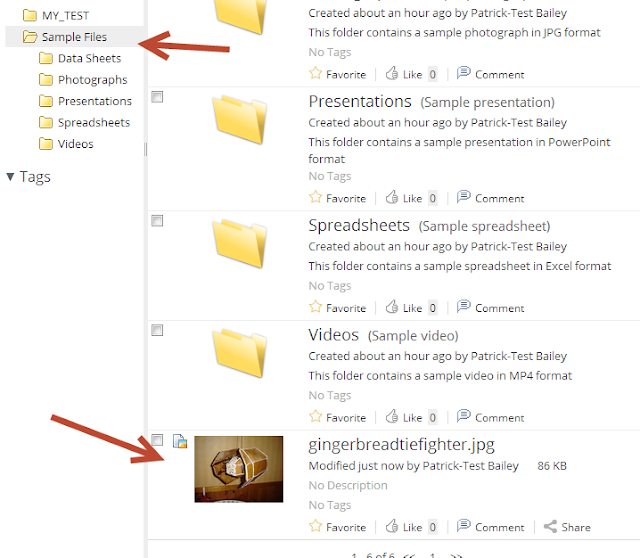 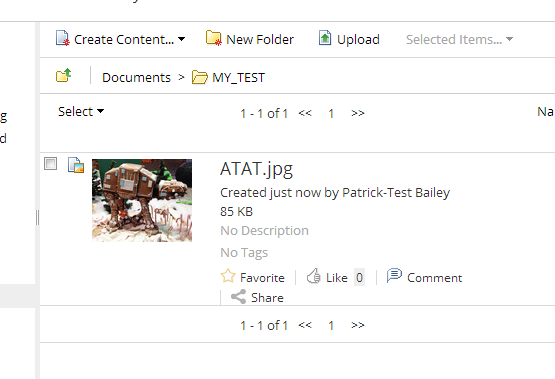 Open the "Sample Files" folder and you will see the image you just uploaded. The action moved it here. 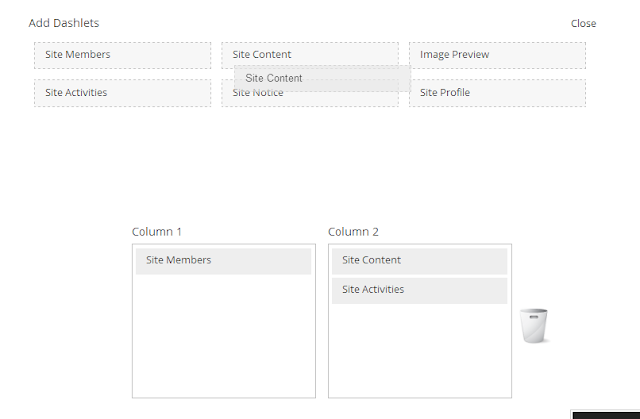 The new site is created and it immediately opens. From here you can change the layout, move dashlets around and add/remove dashlets. That is if you want to. 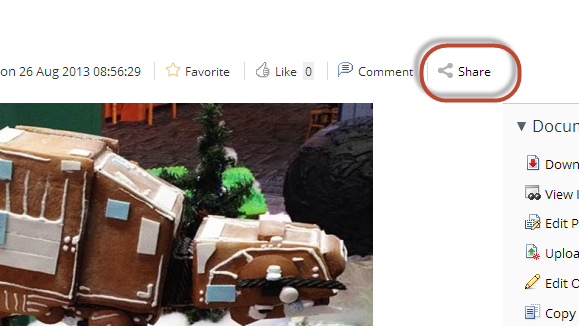 Click cancel to close it. 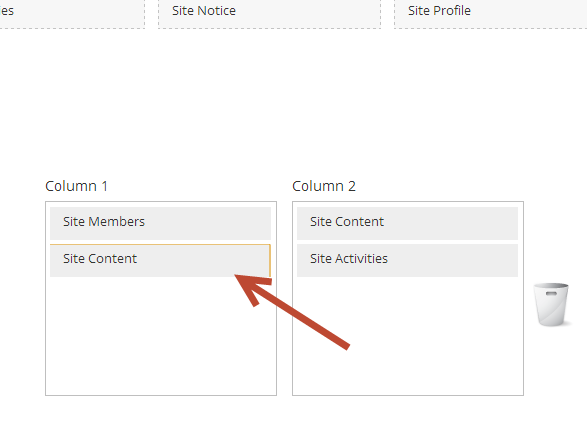 From here you can gran any included dashlet and drag it down to the column you want it to show up on. 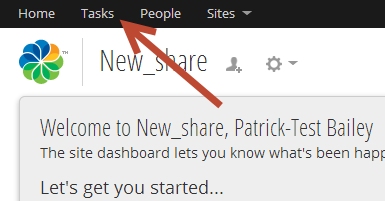 You can add or rearange them here. 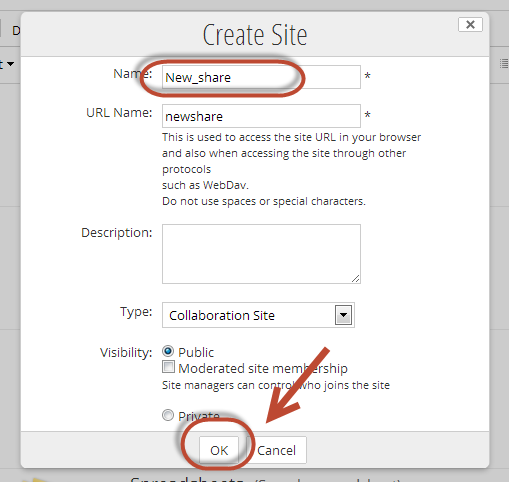 When you are done click OK.
Now on the share site you will see that the "Site Content" dashlet has been added. 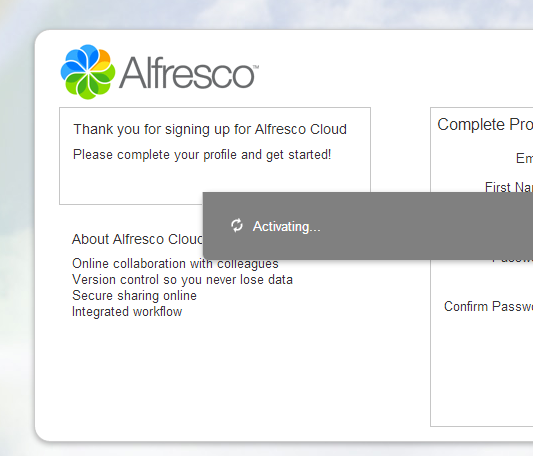 Alfreso cloud has fewer dashlets options than a custom install. 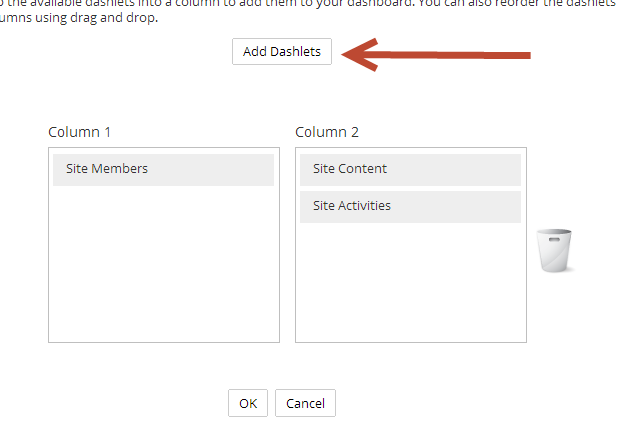 If you look at a custom Alfresco install here are the dashlets available. 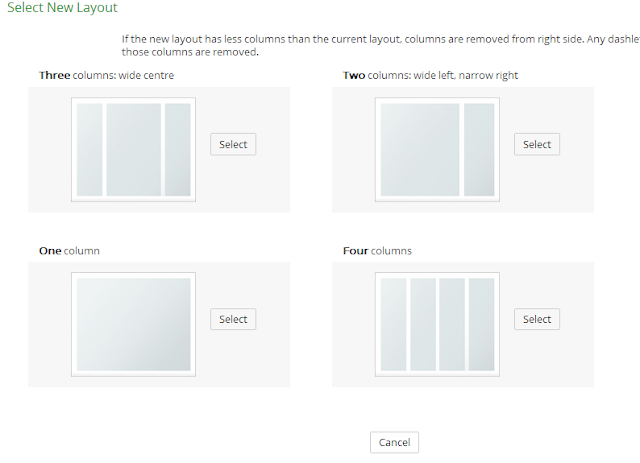 Not a killer for me, there are a few dashlets I do like to use like Web View that would be a bit of a bummer to miss out on. 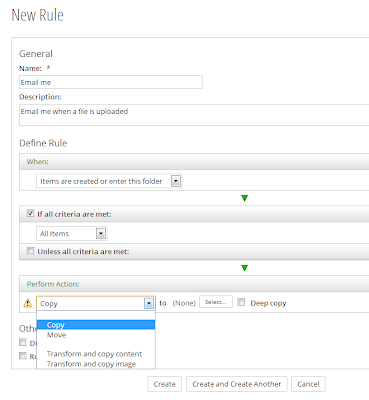 You can version documents by hand, but there seems to be no easy way to automate it. 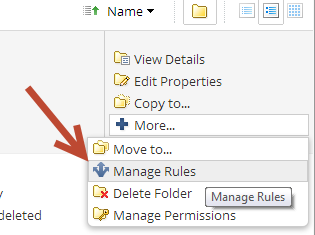 There is an easy way to accomplish this with folder rules, but the aspect portion has been removed from the cloud offering so it cannot be done. 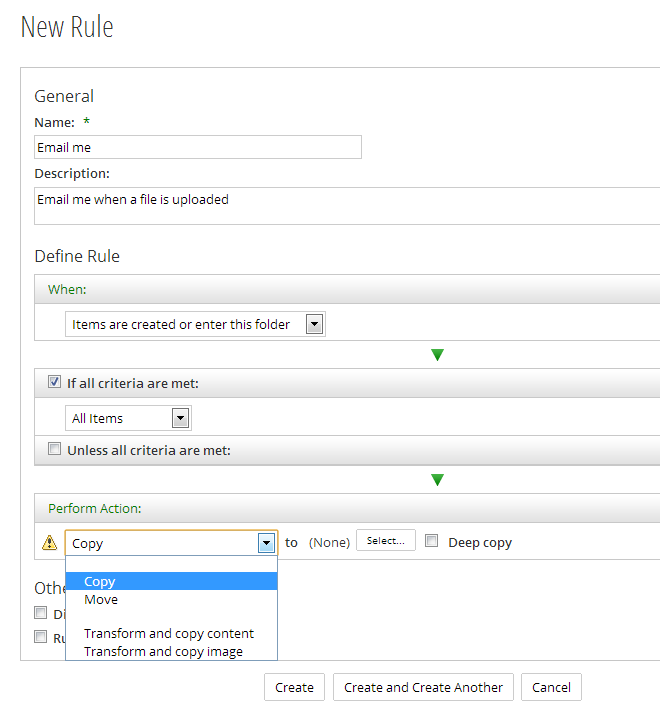 So long story short versioning has to be done by hand. 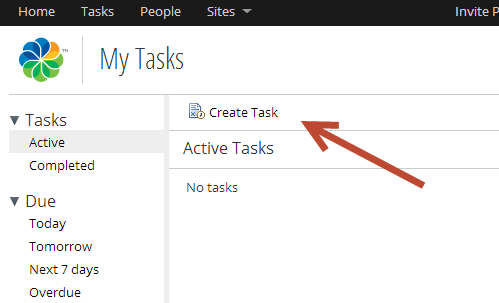 There are fewer types of tasks you can assign, but more than enough to keep you happy until you really need some customization. 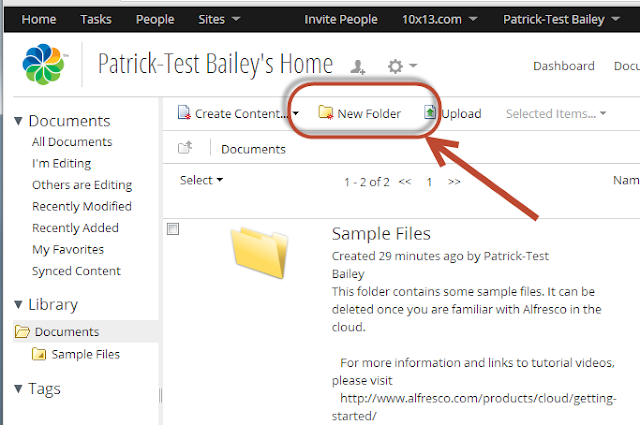 This is a screen shot from Alfresco 4.2 from a custom install. 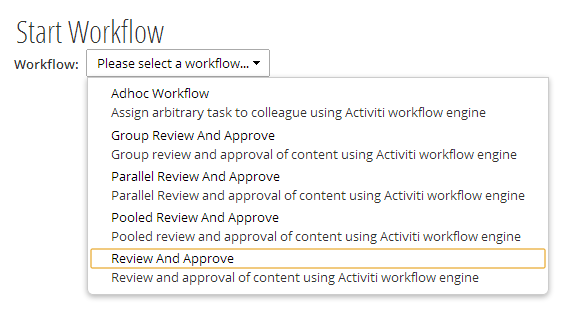 Out of the box there are too many tasks available, that are too wordy in my opinion so good job on the cloud version Alfresco. 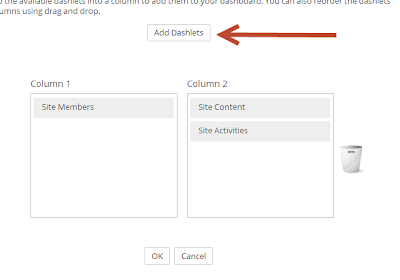 I am not going to go over the setup and use of this program here, I will just say the iphone app works the same with the cloud or with a custom install. 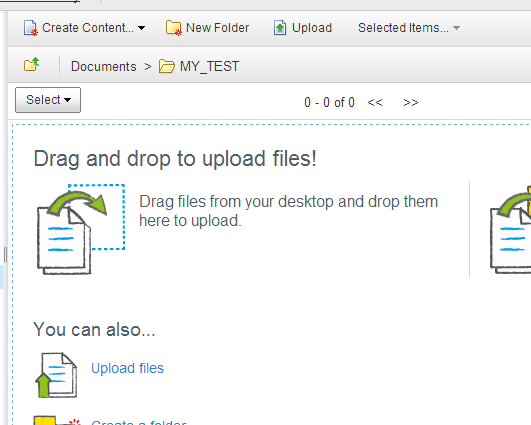 Even using the free version of the cloud. What are the limitations between free and paid? 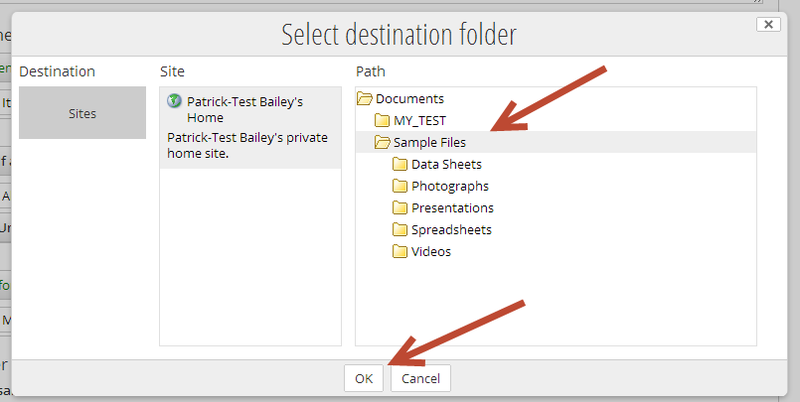 What are the limitation with this free version? The free version is a very nice place to test and if you have very modest needs may be enough for your small business. You can only store up to 10GiB of information. 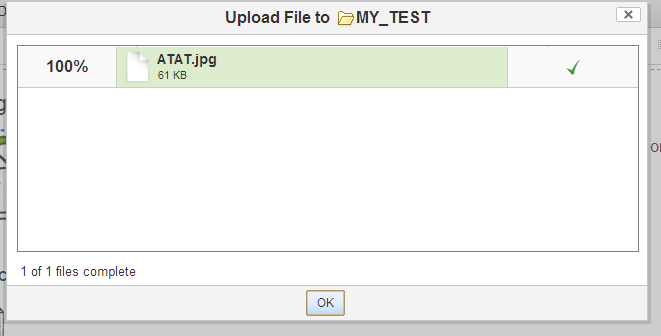 The largest file size you can have is 50MiB and you have no support. The Standard version is not a bad deal, for $50 you get 5 users up to 500GiB of storage and a max file size of 2GiB and some support. 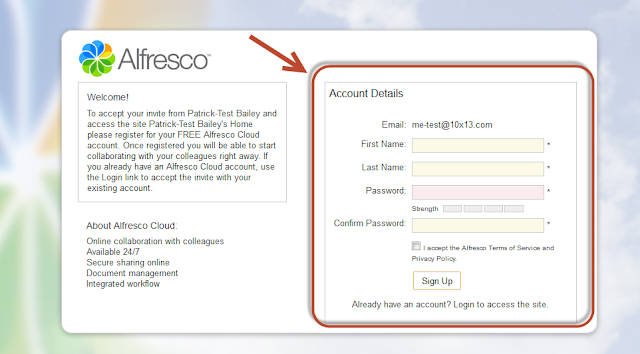 You also can add a user for $9/mo. 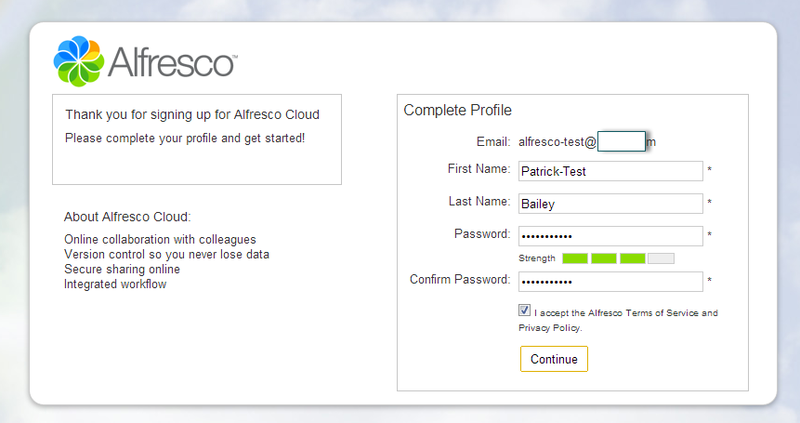 In summary the free version of alfresco cloud is great! 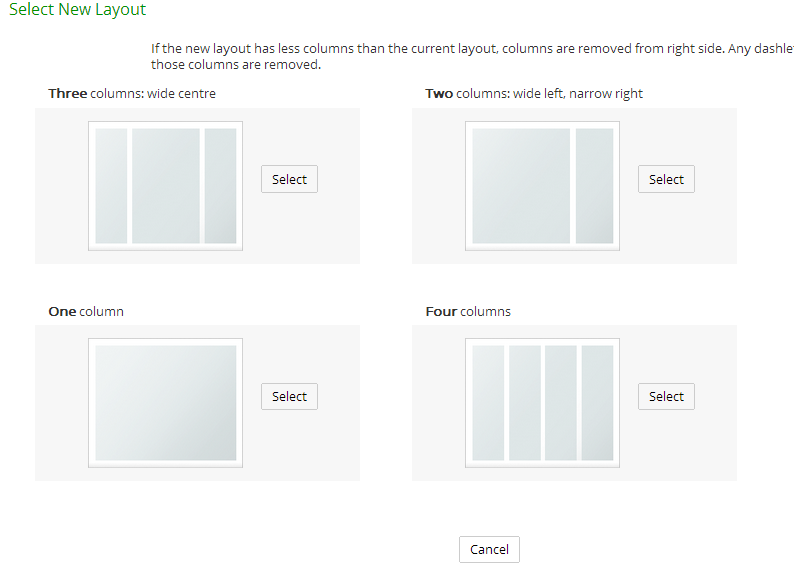 It does a lot for free and does not hamstring you from using it effectively. 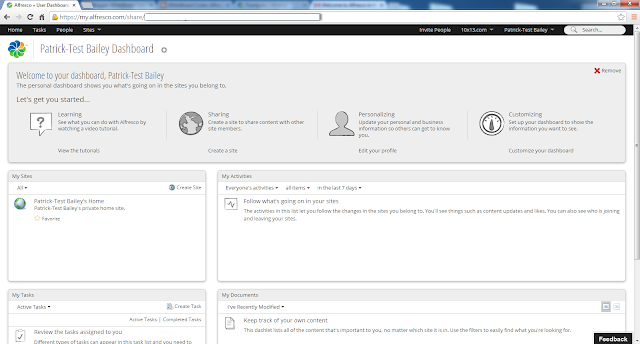 If it works well for you or your business the $50 paid for version is very attractive and may be all you ever need for your small business. 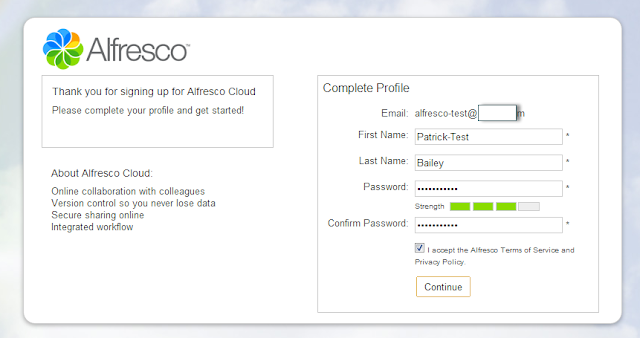 Alfresco cloud also works well with the Alfresco iPhone program! 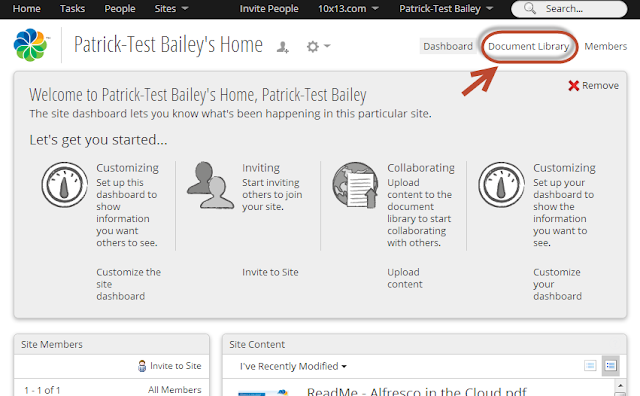 Even if you require a more custom install to help handle your business document management needs Alfresco cloud is still a good place to get your feet wet before diving into the expense of customization.